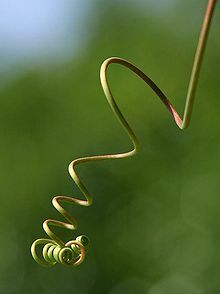 A vine is a climbing plant which use stems or runners. These runners trail on the ground, and will climb up when it is possible. It is a growth habit or life habit which makes use of trees to reach light in natural habitats. In the United Kingdom, the term "vine" applies almost exclusively to the grapevine, whereas the term "climber" is used for all climbing plants. The grapevine, genus Vitis, carries berries which can be made into wine. In the United States, all climbing plants are called vines or ivies or sometimes creepers (like the Virigina Creeper). Most vines are flowering plants. These may be divided into woody vines or lianas, such as wisteria, kiwifruit, and common ivy, and herbaceous (nonwoody) vines, such as morning glory. ↑ Shorter Oxford English dictionary. 6th ed. Oxford University Press. 2007. p. 3804. ISBN 0199206872. This page was last changed on 24 October 2014, at 09:10.